For a distilled brandy to bear the name Cognac, an Appellation d'origine contrôlée, its production methods must meet certain legal requirements. In particular, it must be made from specified grapes, of which Ugni Blanc, known locally as Saint-Emilion, is the one most widely used at the present time. In addition, the brandy must be twice distilled in copper pot stills and aged at least two years in French oak barrels from Limousin or Tronçais. Cognac matures in the same way as whiskies and wine when aged in barrels, and most cognacs are aged considerably longer than the minimum legal requirement. 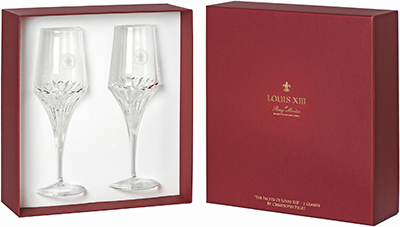 2 Remy Martin Louis xiii Cognac Baccarat glasses by Christophe Pillet - Dossier Magazine. 6 bottles of 1811 GRAN FINE NAPOLEON - Cognac Fans. 6 Cognac Appellations - Grande Champagne, Petite Champagne, Borderies, Fins Bois, Bons Bois & Bois Ordinaires. 1811 – The Comet Vintage - cognac houses have always attributed successful vintages and ideal weather conditions like those of 1811 to comets, hence the name ‘comet vintages’. A Unique Crystal Magnum Decanter of Special Louis XIII Cognac Engraved with a Map of the Americas - Sotheby's. Clos de Griffier Champagne Cognac 1738 - "The Oldest Known Cognac. 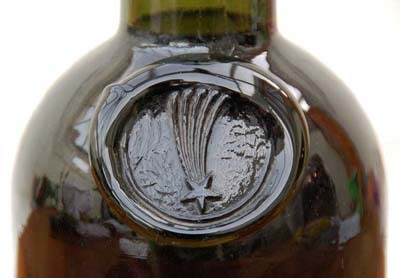 The earliest recorded surviving intact cognac bottle." Clos de Griffier Vieux Cognac - "Man Drops $77,000 Bottle of 1788 Cognac Clos de Griffier Vieux Cognac." COGNAC.FR - "Welcome to the Cognac website." Bureau National Interprofessionel du Cognac's website with history, cognac-making, events, facts & figures. 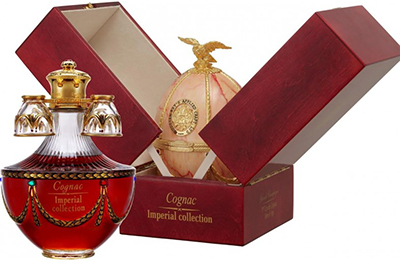 COGNAC EXPERT - "Buy 800 Cognacs Online | Worldwide Shipping." Awarded “International Cognac writer of the Year” in 2013, Cognac Expert is an independent, family-run website based in France, reporting on all things Cognac and shipping exclusively from the Cognac region. COGNAC FOR CIGARS - "These Cognacs have been specially blended to match perfectly with a good cigar. There is a long tradition of marrying cigars and sipping Cognac. A good Havana -even a relatively modest Romeo y Julieta or a Montecristo - will enhance enormously the Cognac experience of a cigar smoker." 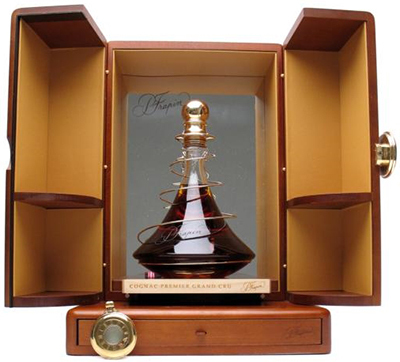 Cognac for connoisseurs: La Part des Anges auction - The Telegraph. COGNAC GRADES - VS, VSOP, XO etc. COGNAC-WORLD - "The World of Cognac." Fifty Best Cognac - TheFiftyBest.com. 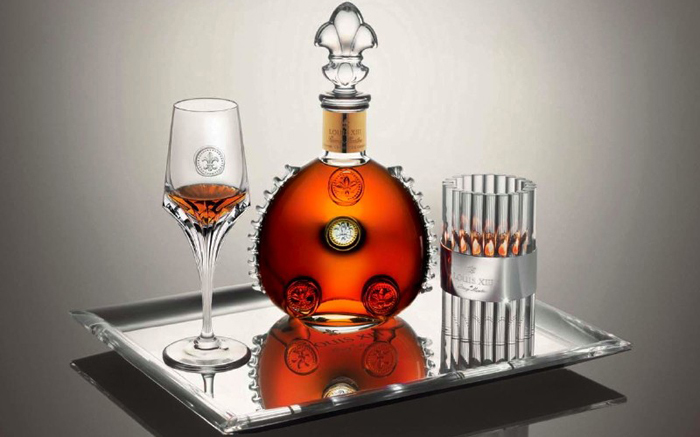 Four Seasons New York & Louis XIII Team Up for Luxury Cognac Experience - Alux.com. Kim Jong-il Spent More on Hennessy in a Year Than Most People Make on Wall Street - World.Mic. La Part des Anges - "An auction of top quality cognacs to sponsor various associations." LE COGNAC - since 1996. "The global rendez-vous for Cognac amateurs and sommeliers around the world." Through Le Cognac you will be able to get hold of the 300-odd labels in our careful selection among the 800 existing Cognac brands, but then also to find and privately order the rarest blends and precious bottles. The Best Cognacs on Earth, indeed. Rolls-Royce Hosts the World’s First ‘Cars and Cognac’ Assembly - Lux Exposé. The art of cognac: Hennessy Paradis ImpÉrial - The Telegraph. Which politician was a brandy firm's biggest customer? - Daily Mail. 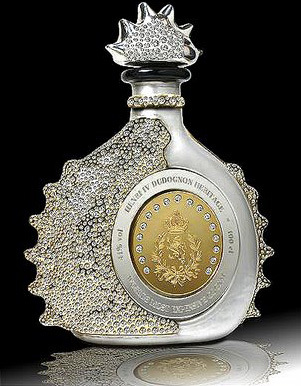 WORLD'S OLDEST COGNAC FOR £4,000 A SHORT - at The Lanesborough hotel's library bar, Hyde Park Corner, London SW1, U.K.
A. DE FUSSIGNY - since 1814. ABK6 - "Single Estate Cognac." A. E. DOR - founded 1858. AndrÉ Petit Cognac - since 1965. "Our Cognacs are elaborated following very old methods." ARCANA - by Jenssen Cognac. Berry Bros. & Rudd - since 1698. 3 St James's Street, London, U.K. All brands. BOWEN - known as much for their miniature sized cognac bottles as the regular. Bowen produces a range of different qualities. BRAASTAD - since 1875. "From Our Castle to Yours." Château de Triac. Situated in the cru Petite Champagne in the cognac area. BRILLET - founded 1850. Their motto is not to impress through high maintenance or expensive containers, but rather through a humble and high quality aesthetic. CAMUS - "Founded in 1863, CAMUS is the largest Cognac house to still be entirely family-owned." CARTE BLANCHE - by Jenssen Cognac. 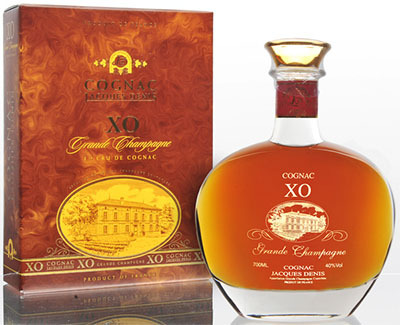 XO Grande Champagne Cognac. CHÂTEAU DE BEAULON cognac - "Château de Beaulon Cognac has always been, and continues to be, created purely from the fruits of a single vineyard, and is recognized around the world as being a highly desirable, artisan produced cognac." CHÂTEAU DE MONTIFAUD - founded 1866. "The house produces a large, high quality range of cognacs - including various vintages from years that have had an exceptional harvest." COGNAC COUPRIE - founded 1730. "Cognac couprie, eau de vie, liqueurs, pineaux des charentes." Cognac Croizet - founded 1805. "Croizet cognacs owe their distinctive style to their unique geographical origin - Grande Champagne." COURVOISIER - founded 1835. The production is based in the town of Jarnac in the Charente region. Legend has it that Napoleon I later took several barrels of cognac with him to St Helena, a treat much appreciated by the English officers on the ship, who named it "the Cognac of Napoleon". Courvoisier ERTÉ 1-7 Collection Cognac - "The bottles of the Erté Collection were designed by Russian deco-artist Erté and contain an extraordinary blend of precious Grande Champagne cognacs. The legendary cognac house commissioned the seven bottle set from the Russian-born artist for its extraordinary blend of precious Grande Champagne cognacs, some dating back to 1892. Only 12,000 bottles were made of numbers 1 to 7. 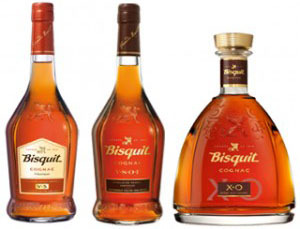 Each of the bottles’ design represents a different facet of the cognac making process." COURVOISIER L'ESPRIT DECANTER - "Assembled using the very oldest and finest eaux-de-vie - with vintages as far back as 1802 rumoured to be in the assemblage - L'Esprit de Courvoisier is one of the most exclusive and highly sought-after Cognacs ever produced." 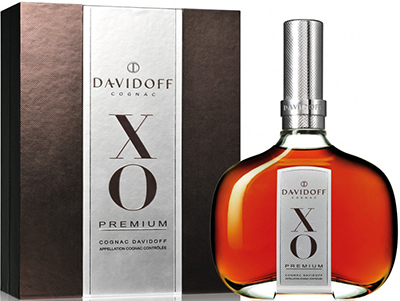 DAVIDOFF - "The ‘raison d’etre’ behind Cognac Davidoff is the production of a cognac that is specifically designed. Zino Davidoff (1906 to 1994) made quality his philosophy - for friends and customers. This tenet still characterises the essence and the products of the Davidoff Luxury Group today, with our two cognacs, Davidoff VSOP and Davidoff XO, representing the latest manifestation of such a special claim." 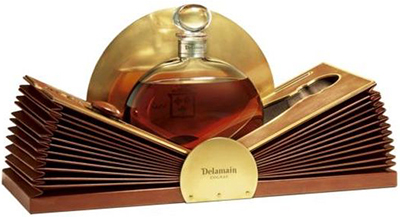 DELAMAIN - "The family-run house of Delamain is one of the oldest Cognac producers, founded in 1762. The company is rare in that it produces no VS or VSOP Cognac, and also chooses to reduce bottle strengths down to 40% abv with 'faibles' (old, low-strength Cognacs) rather than with water." ESTEVE - "Très Vieux Cognac." With 45 hectares of Petite Champagne vineyards, the house of Famille Esteve Cognac is an independent and traditional one. Boasting seven generations of skills and knowledge, the house prides itself in producing a range of cognac that are composed mainly of older eaux-de-vie. ET No 1 - "Art for all senses." 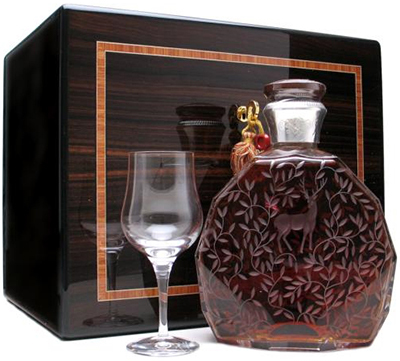 Limited-edition collaboration between Swedish glassmaker Transjö Hytta and Cognac Tiffon. A blend of eaux-de-vie from 1870, 1943 and 1974, this is an exceptional Cognac that combines the best of two worlds of craftsmanship. FRANÇOIS VOYER - "L'excellence des grandes terres de Cognac." FRAPIN - "The Frapin family have been based in SW France since the late 13th century, and have a history of distillation in the Cognac region for 20 generations. Located in the heart of the Grande Champagne region in Segonzac, they own all of their vineyards and are noted for their Multimillésime releases, a blend of three vintages, all of which are stated on the bottle." GAUTIER - "Indepent since 1755." Discover Maison Gautier, a cognac crafted with generosity since 1755. 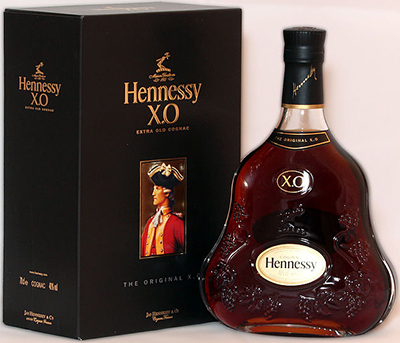 Recognized several times as the World's "Best Cognac". GIORGIO G XO Cognac Limited Edition - "The Best of the best. A blend of over 70 crus, from Grande Champagne, Petite Champagne (Champagne is the French term for chalky soil), and Borderies Cognacs. Every Cru stands for a different fragrance such as flowers, green fruits, grapes and others." GUERBÉ - Cognac Grande Champagne. Three generations have been looking after the vineyards of Guerbé Cognac that are located in the heart of the Grande Champagne region of Cognac. HARDY Cognac - "Haute Couture for Cognac." It was in 1863 that Anthony Hardy, a London gentleman, settled in Cognac and established himself in the business of high-quality wines and spirits. Five generations later, Hardy Cognac is known for its character and for the skills of its cellar masters, custodians of a heritage handed down forever. Ambassadors and pilgrims, the Hardy family traveled the planet to make known their cognac: the Hardy style in all its forms. HENNESSY - founded 1765. "Jas Hennessy & Co., or more simply Hennessy, is a cognac house with headquarters in Cognac, France. Jas Hennessy & Co. sells about 50 million bottles a year worldwide, or more than 40 percent of the world’s cognac, making it the world's largest cognac producer. It is owned by Moët Hennessy, which is in turn owned by LVMH (66%) and Diageo (34%)." Hennessy BeautÉ du SiÈcle Cognac - "This is an exceptional work, and one of the most expensive Cognacs in the world. Hennessy Beauté du Siècle was created by blending the rarest eaux-de-vie of Hennessy. This limited edition (only 100 items produced) was created by French artist Jean-Miche Othoniel, for Kilian Hennessy, who managed Hennessy from 1945 to 1975." US$200,000. 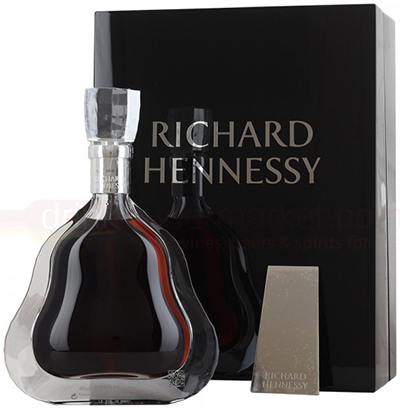 HENNESSY PARADIS - comes in a 70 cl decanter, 40% ABV. Its blend is a very fine one, combining over 100 different eaux-de-vie spirits, some of them were distilled in 1880. North Korea's Kim Jong-il's favorite drink; spends reportedly approx. US$750,000 per year importing it. HENNESSY V.S.O.P. PRIVILÈGE - a cognac that is at least 4 years old, aged in Limousin oak barrels. 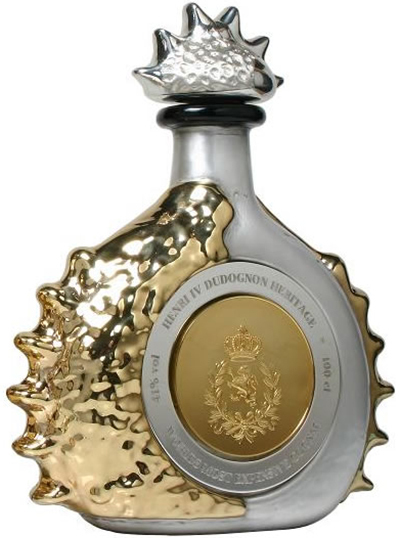 Henri IV Dudognon Heritage Cognac Grande Champagne V - an elixir mixed since 1776 by the direct descendants of King Henri IV, each batch of Henri IV Dudognon Heritage is aged in a barrel for more than 100 years and capped inside a 24-karat gold-dipped and 6,500 diamond-bejeweled bottle. Price: £1,000,000. HINE vintage cognacs - "Founded in 1763, Hine Cognacs are highly regarded around the world for their quality and complexity – from the entry-level H By Hine to the prestige cuvée Talent. The house is one of the few to regularly release vintage Cognacs, aged in the cellar until they are ready for bottling." Hine Triomphe Cognac Talent De Thomas Hine Crystal - "The cognac is presented in a Baccarat crystal decanter with 4 crystal glasses and is packaged in an ebony and mahogany cigar humidor." JACQUES DENIS - since 1981. "Located in the village of Saint Preuil, in the heart of the Cognac region, the family owned house of Jacques Denis Cognac provides a select range of hand produced, artisan cognacs." JEAN FILLIOUX - "The Traditions since 1880." The vineyards lie in the heart of the Grande Champagne in the "golden triangle": Verrières, Angeac-Champagne & Juillac-le-Coq. JEAN GROSPERRIN - independent cognac house created in 1992. JENSSEN cognac - "The house of Cognac Jenssen is located in the heart of premier cru Grande Champagne - in the highly desired ‘golden triangle.’ Jenssen Cognac grows grapes on 25 hectares of vineyards and produces a small range of cognacs that range from VSOP to the prestigious 98 year old "Arcana." Le VOYAGE de DELAMAIN - "The Voyage de Delamain is Delamain's ultra premium flagship: It comes in an elegant and unique packaging, in a 70cl Baccarat crystal decanter. The price of this unique item is at around 6,000 euro. The blend is a pure Grande Champagne cognac." LE RÉVISEUR - "Single Estate Cognac." Cognac Réviseur embodies the attributes that have made the Petite Champagne cru that it comes from famous: intensity, full body and aromatic richness. LE ROCH - one of the last few independent cognac houses, was founded by Mr Jean Grosperrin, broker & cognac merchant, in 1992. LÉOPOLD GOURMEL - since 1972. 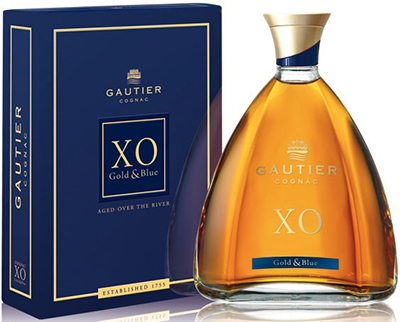 Differs from most Cognac houses in that it eschews the standard VS/VSOP/XO classifications in favour of more style-led terms that give an indication of the flavour. LEYRAT - "I chose the Domaine at Chez Maillard for the exceptional terroir over the 90 hectares of vines. Situated on top of the limestone hill with lots of sunshine, this reputed vineyard in the Fins Bois gives fine and elegant eaux-de-vie with astonishing quality." LOUIS XIII DE RÉMY MARTIN - since 1874. "The King of Cognacs." Each decanter is the life achievement of generations of Cellar Masters. LOUIS XIII BLACK PEARL DE RÉMY MARTIN - limited edition. Only 358 individually-numbered hand-blown Baccarat crystal decanters exist in the world, 20,000. Louis XIII L’OdyssÉe d’un Roi - sold for US$134,750 on September 10, 2016 at Sothebye's New York. 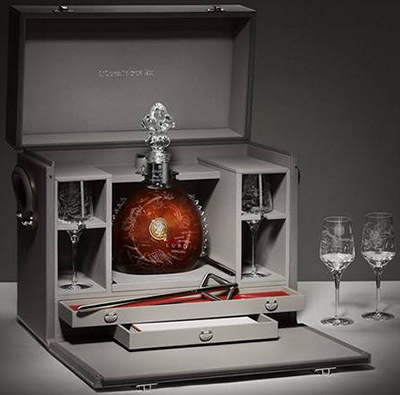 LOUIS XIII Rare Cask 42.6 Cognac DE RÉMY MARTIN - "Pierrette Trichet, the cellar master of Rémy Martin, found the valuable content from this bottle only in one single cask. 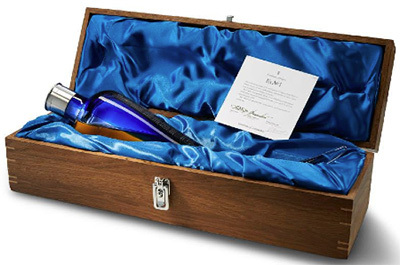 It was that little that just 738 bottles were made from it with each decanter individually numbered. 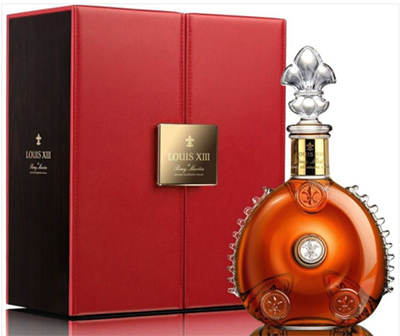 42,6 degrees of alcohol give this unique Louis XIII its name." LOUIS BOURON - founded 1832. "Having been Cognac producers for the past five generations, today we offer our "aficionados" a large range of Cognac, in which tradition meets modernity." LOUIS ROYER - "Famous for its bee emblem, Cognac Louis Royer traces its history back to the year 1853 and is known for a wide range of quality cognacs and Pineau." MAISON DUDOGNON - since 1776. "Located in Grande Champagne 1er Cru du Cognac, we are farmers: we feed and work the land for several generations while respecting the delicate balance of the soil. We are growers and take care of the vine." 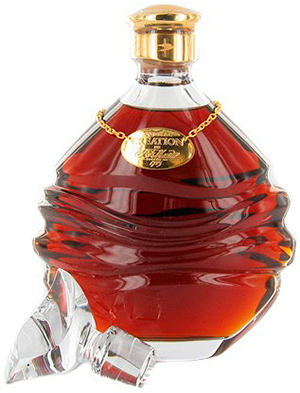 MAISON DUDOGNON: HENRI IV DUDOGNON HERITAGE - "The DNA of Cognac ..." World most expensive cognac: 3,4 million dollars. Dipped in 24 K Yellow Gold & Sterling Platinum and decorated with 6,500 certified brilliant cut diamonds. With an approximate weight of 8 Kilograms, it is filled with 100 cl. of Dudognon Heritage Cognac Grande Champagne, aged in barrels for more than 100 years to produce an alcohol content of 41%. MARTELL - one of the oldest cognac houses. Founded in 1715 by Jean Martell (1694-1753). NORMANDIN-MERCIER - founded 1872. Concentrating solely on cognacs produced from both the Petite & Grande Champagne. PAUL BEAU - "With a history dating back to the 19th century, the house of Paul Beau Cognac boasts over 100 hectares of prime Grande Champagne vineyards." RAYMOND RAGNAUD - founded 1715. "Cognac Grance Champagne." RÉMY MARTIN - French firm that primarily produces and sells cognac. Founded in 1724 & based in the city of Cognac, it is one of the biggest cognac producers. The brand specialises in Cognac Fine Champagne. RÉMY MARTIN LOUIS XIII - since 1874. "The King of Cognacs." 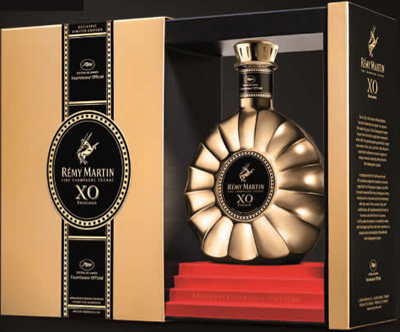 RÉMY MARTIN XO Excellence - exclusively made for the Cannes festival 2014. Available in the 70/75 cl format as well as in a series of 22 jeroboams, the bottle demands celebrity status in its own right! 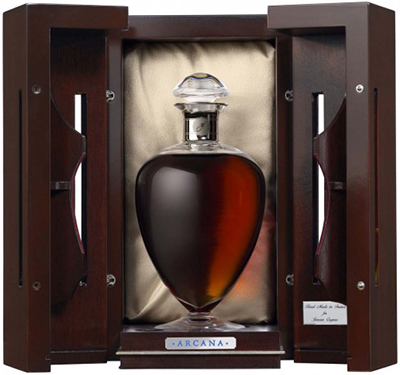 RICHARD HENNESSY COGNAC - exceptional blend of the world's rarest eaux-de-vie in a beautiful Baccarat crystal decanter. ROULLET cognac - founded 1780. "Historically the Cognac House's vineyards are situated in the so-called Gold Triangle of Fins Bois which offers the best soil containing mainly hard limestone, which provides the possibility to obtain full-bodied and rapidly maturing cognacs, with a charming round and smooth fruit taste." TIFFON - founded 1875. 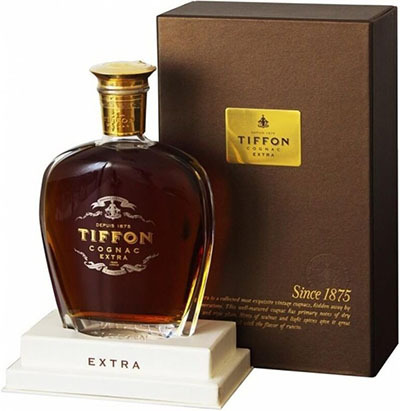 "With strong ties to the Scandinavian country of Norway, the history of Cognac Tiffon dates back to 1875. Today, the family grows 40 hectares of Grande Champagne and Fins Bois vines, overseen by cellar master Richard Braastad, who comes from an old cognac producers’ family." 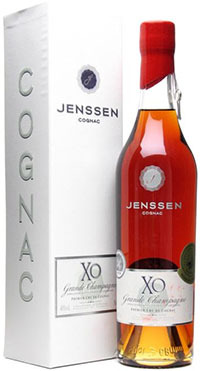 XO GRANDE CHAMPAGNE - by Jenssen Cognac. Aged of 25 years in oak barrels. A pure Grande Champagne Cognac. This XO won Médaille d'Or at the Concours Mondial de Bruxelles April 28, 2006.